﻿The Juma Lake Inn Lodge and farm is situated at the entrance of the natural reserve, built on pales in the typical style of regions that are partly flooded. 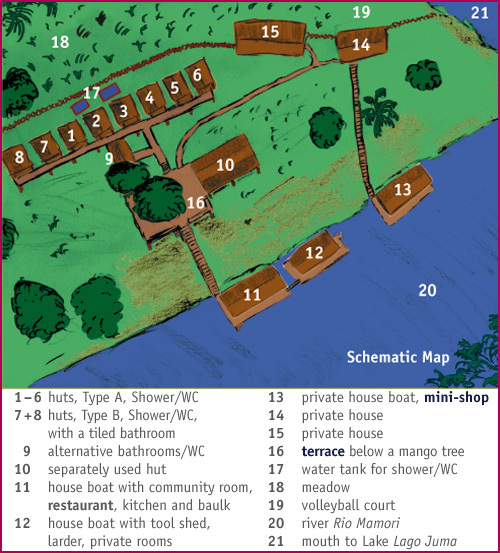 The lodge is constructed on a small peninsula between the beautiful Juma Lake and the River Mamori. 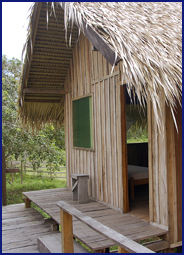 An impressive highlight of any trip to Brazils nature is the stay in the jungle of the Amazon. On a jungle tour or jungle expedition you will get remarkable insight into many wonders of the tropical rainforest. As an Amazon specialist, we invite you to experience the Amazon rainforest on a trip to the fascinating world of the Rio Juma and Rio Mamori. A Visit on our Jungle Lodge will be a Highlight of your Brazil Trip! The special feature of the lodge is that it vastly differs from other tourist lodges. Here, a family community invites you to get to know the original and pure life close to nature in the Amazon region. It is ideal for all who want to experience typical hospitality in a pleasant atmosphere. The tasty meals, the friendly mood in a natural surrounding and the insights into everyday life of the habitants are particularly appreciated by the guests.